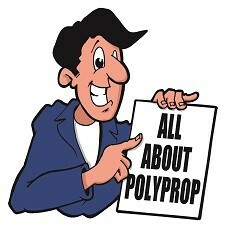 So this month I thought we’d dig into polypropylene or polyprop for short and as we tend to call it. Now all plastics seem to have their very own claim to fame or a party trick and polyprop is no exception, this one can actually help identify itself. If you’re struggling to identify what material you have (they can look very similar), just get a bucket of water and pop the item in, if it floats you’ve probably got polyprop. Yep, price wise it’s at the lower end of the spectrum, I did a very rough calculation and it priced at about 17% less than natural nylon6 and a whopping 48% less than acetal, so there’s some decent potential savings to be had. Read to the end of this article though before you go dashing off swapping over just yet, as always there’s more specs. Well there’s the water resistance, which helps it for things like water treatment areas, there’s also electrical resistance so it’s good as a barrier there (although actually most plastics are) and let’s not forget wear resistance, we wouldn’t put it up there with the big boys but it’s used a lot for castors, and they seem to last pretty well. There’s two types you say? Most polypropylene is the ‘homo-polymer’ grade (homo meaning single) so ‘single-polymer’. But in sheet form there is another grade known as ‘co-polymer’ (co- meaning two) so this material has another polymer mixed in, namely HDPE. Now; Co-polymer polypropylene because it has HDPE mixed in, is more flexible and even has a better impact resistance. Most of the bright coloured sheet used in the prosthetic industry is the co-polymer grade, it’s a bit more expensive but there are those advantages which probably offset the cost. Well here we are at a contentious subject, with correct tooling and set-up its fine but in our opinion it does take a bit more effort. You have to be that bit more careful of speeds, feeds, cutters and coolant mainly. Because polypropylene has a pretty low melting point, once it starts getting hot (as machining always creates) it starts to melt which is going to leave a poor surface finish, it also leaves a ‘fash’ so you’re going to need your trimming tool. What if the temperature rises? This is another tricky subject, with a max long term service point of just 80 degrees centigrade, that’s 20% less or 20 degrees if you like lower than Nylon6. Now 80 degrees is still pretty damn hot but it’s a factor that needs considering, also that reaction tends to follow throughout, so it’s then got a lower melting point and guess what; the material will tend to become soft or will soften (deform) at again a lower temperature. Bonding with adhesives is very difficult, a subject we discussed a while back but certain materials have a ‘low surface tension’ and you guessed it Polypropylene is right in there. Adhesives aren’t able to attach themselves so if you’re wanting to fasten 2 items I reckon you’re going to need to physically fix it by mechanical means (nuts & bolts) or hot air welding, again a subject we’ve covered before. Nowadays, there are adhesives that do advertise some form of adhesion, but I understand it’s very limited. Fire rating isn’t anything to write home about, it has the HB class which means it will keep on burning once the flame is removed, not sure it’s the highest thing on everyone’s list but it’s there as a consideration. Am aware I’m repeating myself here, only because I’ve mentioned most of this stuff earlier: acid tanks and chemical tanks, soft hammer heads, we’ve also mentioned casters or wheels on trolleys. Drifts and/or handles on tools that are perhaps going to take a beating, even rolling pins for pastry. In terms of sheet applications, we’ve seen it as cladding sheet for certain locations, water treatment areas like sluice gates and one of the big applications is in the prosthetics, orthotics and medical industry where it can be easily moulded, typically shoe inserts to correct foot alignment etc. Rod is available from 10mm right up to 300mm, sheet-wise (homo-polymer) is available from 1.5mm upto 50mm (thicker and thinner as a special) the co-polymer sheet tends to be a narrowed range, typically 2mm upto around 12mm, the advantage with co-polymer is that colours are available and some fancy ones at that. Its very good at water, acid and chemical resistance, very light, floats in water, tough as old boots and pretty economical. But it’s not as easy to machine, lower operating temperatures, burns easily and difficult to bond with adhesives.